Keto Strawberry Fudge Recipe with a "Delicious" Vanilla Layer - EASY! 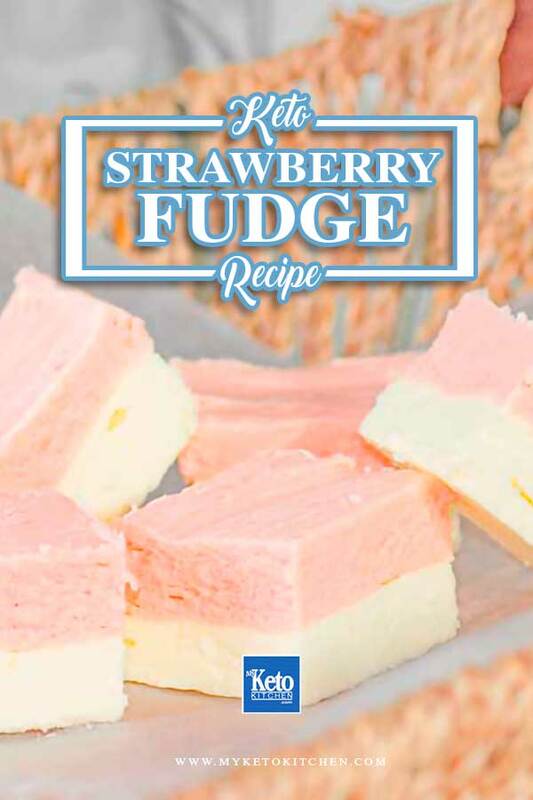 This delicious keto strawberry fudge recipe is a great snack to make ahead of time when visitors arrive or between meals. This low-carb fudge recipe is a great way to get that extra fat into your diet while keeping it sugar-free. This Keto Strawberry Fudge recipe will be a hit at dinner parties or with your morning coffee for some extra energy. Try our other Fat Bombs Recipes, including Pina Colada Fat Bombs or our Red Velvet Fat Bombs. 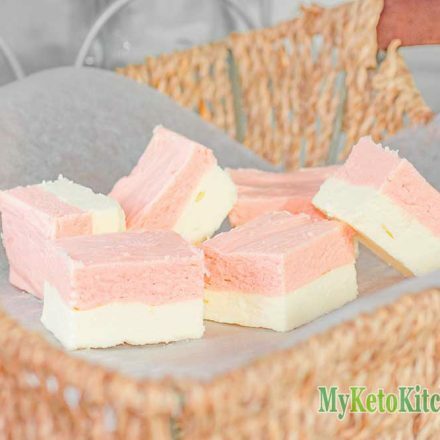 This Keto Strawberry Fudge Recipe is a delicious fat loaded snack that’s perfect for a hit of energy or between meal. Place the softened cream cheese, softened butter, vanilla extract and erythritol in a bowl and mix with a hand mixer on low speed. Slowly build up to medium/high speed, until all ingredients are really well combined. Pour the vanilla layer into the lined tray and smooth out as evenly as possible. Set in the fridge for at least 30 minutes. As you did with the vanilla layer, place the softened cream cheese, butter and strawberry protein powder in a bowl. Mix on low speed with a hand mixer.Slowly increase the speed to medium/high until all ingredients are really well combined. Pour the strawberry layer on top of the vanilla layer, smooth it out and set in the fridge for 1 hour. Cut your fudge into bite-sized pieces and keep it cool, as it will soften very quickly in warm temperatures. 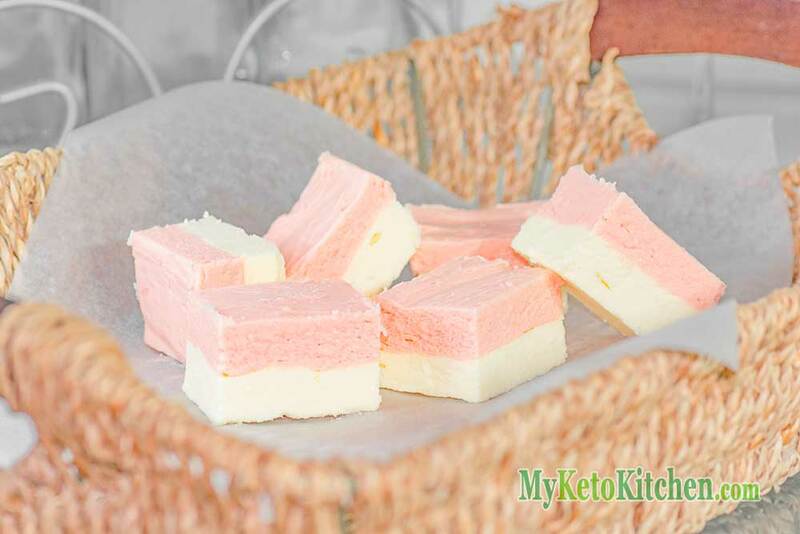 A clever Keto Strawberry & Vanilla Fudge. So Sweet and Tasty... "You won't believe how Delicious and Easy this Fudge is to make. Make it this Fudge in batches and keep it as Snack when you need some Energy or in between meals. Place the softened cream cheese, softened butter, vanilla extract and erythritol in a bowl and mix with a hand mixer on low speed, slowly building up to medium/high speed until all ingredients are really well combined. Pour the vanilla layer into the lined tray and smooth out as evenly as possible, set in the fridge for at least 30 minutes. As you did with the vanilla layer, place the softened cream cheese, butter and strawberry protein powder in a bowl. Mix on low speed with a hand mixer and slowly increase the speed to medium/high until all ingredients are really well combined. Cut your fudge into bite sized pieces and keep it cool, as it will soften very quickly in warm temperatures. Note: When the fudge divided into single serves the protein and carbohydrate content registers less than 1/2 gram each much less. So it protein and carbs do not register in the Nutrition Label. For a larger batch of this Keto Strawberry, Vanilla Fudge recipe adjust the servings in the card above. Just wondering if it’s OK to swap out the erythritol for stevia? 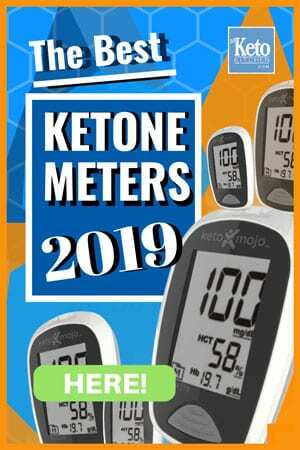 It’s much easier for me to get stevia over erythritol thank you! You could use stevia, however, it does have a distinct aftertaste when used in certain recipes like this one. But if you can tolerate the aftertaste you can give stevia a go. We’re just uncertain as to how much you might use as it took some testing to get the erythritol right.